A while back I posted about the much raved about Jason PowerSmile Anti-Plaque and Whitening toothpaste and absolutely loved it, but I do love trying new things, so after getting through a few tubes I thought it was about time that I experimented with something else. After being mightily impressed with the Jason range, it made sense to give one of the other toothpaste options they have a go. Obviously cavities, tartar and plaque aren't something I'm particularly able to fully keep tabs on and use to assess the greatness of this toothpaste so it really is down to whether or not i like the formula, the texture and the taste really. This formula is a natural formula but does contain fluoride (which the other one does not) but it is said to be naturally derived (couldn't find any further info on this, which would be interesting to know). 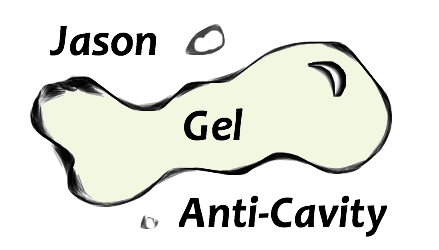 Also the formula is a gel rather than a paste. Not only is it like a jelly but it is also much smoother and thinner than the paste formula. It doesn't have nearly as much of the grittiness that the fluoride free one has either. It is still peppermint flavoured though. The first thing I noticed when using this paste is that it is much easier to get out of the tube which is always a good thing when like me in the mornings you are about as coordinated as a pig with a knife and fork. However, the gel or even jelly like texture makes it awkward on the brush and I often end up with globules sliding off, even more so i find it awkward for brushing with. It just doesn't seem to mix well with the water and is quite hard to really smoosh into your teeth for a good old brushing and i don't feel like i get a very good coating or that it's really being distributed around my teeth properly. More often than not i end up just dribbling (attractive, as you can imagine) with bit of jelly oozing out (even more attractive!) The result is i use twice as much of this paste because i'm always feeling like i'm having to replace it when it's gone awry (dribble and off the brush wise) and because my teeth don't necessarily feel as powerfully clean as i'm used to from the other one. Now granted because the texture of this gel is less gritty it wont make my teeth feel as scrubbed as the other paste but it still contains the Bamboo powder, Baking soda and Calcium Carbonate to give them a proper clean. But it just doesn't quite feel like it. Now this may be my imagination but i also think that this isn't keeping my teeth as white as the fluoride free formula either. Overall, I would say that this is a 'nice' toothpaste (gel) it does the job 'fine', nothing terrible, nothing impressive. It doesn't hold up much against the fluoride free formula, it just doesn't have the wow factor that that one does. Personally I don't like the gel formula, i find it messy and annoying and doesn't enhance the paste in anyway. But credit where credit is due, it is still a decent natural alternative to traditional pastes, it cleans your teeth and freshens my breath and gives that nice fresh, cool, zingy feeling and even tastes quite nice. But I'll be sticking to the fluoride free version for sure.